ROOT ANDROID 4.4.2 三星 S4 (GT-I9500) ON KITKAT - Android 手機開發 - TShopping - Powered by Discuz! Samsung [color=rgb(27, 142, 222) !important][backcolor=transparent !important]USB Drivers or [color=rgb(27, 142, 222) !important][backcolor=transparent !important]Samsung Kies. 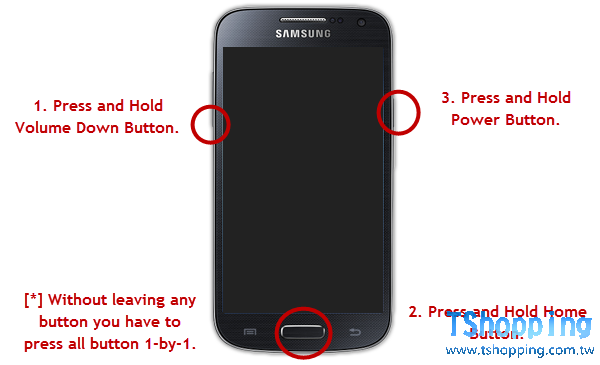 (if you dont have Kies [color=rgb(27, 142, 222) !important][backcolor=transparent !important]installed simply grab the Samsung USB Drivers from HERE. Step 1: Download all the required files from the above given links and keep them in a easy to access place by unzipping them on Desktop. Step 2: Install Samsung USB Drivers(You don’t need them if you have Kies installed in your system). Step 3: Now turn off your phone to enter the (Download Mode) by pressing and holding the (Volume Down + Home + Power buttons) at the same time for a few seconds and release it when you see a warning message on your screen. Step 4: Next you will be prompted to press volume up button to continue just do it. Step 5: When you are successfully entered into the (Download Mode) take a deep breath and Open Odin3 app on your desktop. Step 6: Now connect your phone to the computer, let the USB drivers load and wait for Odin ID:COM port to turn blue along with a message on Odin saying Added. This shows that you are successfully connected to Odin and good to go further for flashing. Step 7: Click on the (AP) button located on Odin App and browse the CF-Root package that you unzipped, select the tar.md5 file. Step 8: Finally hit the (START) button in Odin to initiate flashing the CF-Root package. GMT+8, 2019-4-20 22:33 , Processed in 0.039183 second(s), 22 queries .